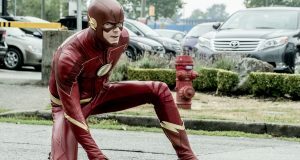 So, how did The Flash do last night? Overnight ratings might not be totally accurate this time around, as the show was pre-empted in Chicago. Right now, we’re looking at 3.66 million viewers and a 1.2/4 in the 18-49 demo, still a good number for The CW. 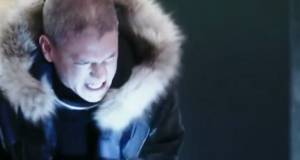 What did you think of “Who Is Harrison Wells?” Come talk about the episode on our Flash forum! This episode was better in different ways. First of all it wasn’t at all silly like, like the first one even though the last one did have some good parts to it. It was really good to see a smart but cunning meta human this time. One that did challenge the flash team in a way. It was also good not only to see Eddie have a bigger role so far this season, but it was also really good to see a more light hearted Lance and Laurel in this one even though their parts were small. 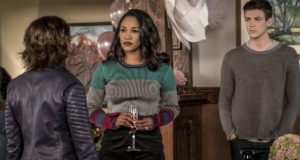 Plus that scene with “Barry” and Caitlin was interestingly good as it showed that Caitlin has been hiding some feelings from the real Barry which was good to finally see what she thought of him. The final fight scene between Barry and the meta human was really good to see especially when he took the form of the ones Barry cared about which was a rather fun add to it all. 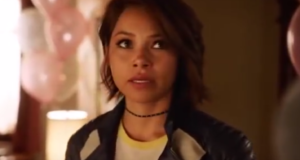 But the biggest part was where Barry, Cisco and Caitlin discovered “Dr. 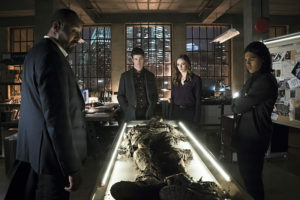 Wells” secret lair with his reverse Flash suit and all of them discovering that the flash will vanish in the mere future, which happened to be my favorite part of the whole episode. Overall it was still very very good. Can’t wait to see what happens between all of them and Wells.